One of the first wildflowersof springtime, the Primrose is a real favourite with gardeners too. 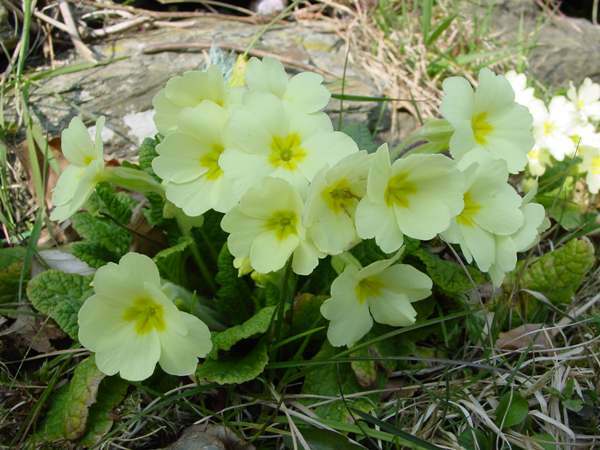 A perennial, the Primrose produces neat hemispherical clumps typically 10 to 25 cm tall. The rosette of basal leaves is often visible right through the winter except in exposed locations. The short-stemmed leaves can grow to 20cm or so in length, and their wrinkled surfaces and crinkly or slightly toothed margins are quite distinctive. Flowers, each with five notched petals, are typically 2 to 4cm in diameter, pale yellow with a deeper yellow or orange-yellow centre, and slightly scented. Each flower is usually borne singly on a slender stem. Flowers may have a long prominent style, as shown on the left, in which case they are known as pin flowers or pin-eye flowers; or the style may be shorter and the stamens most prominent - an example is shown below - when they are referred to as thrum flowers or thrum-eye flowers. Primrose flowers are hermaphrodite. Fertilisation is usually achieved between a thrum-eye flower and a pin-eye flower; pollination from pin to pin or thrum to thrum is not generally effective. Most of the flies of early spring are very small and tend to go unnoticed, but they have no difficulty finding Primroses and helping with their pollination. Although localised, Primroses occur also in North Africa and in parts of western Asia. 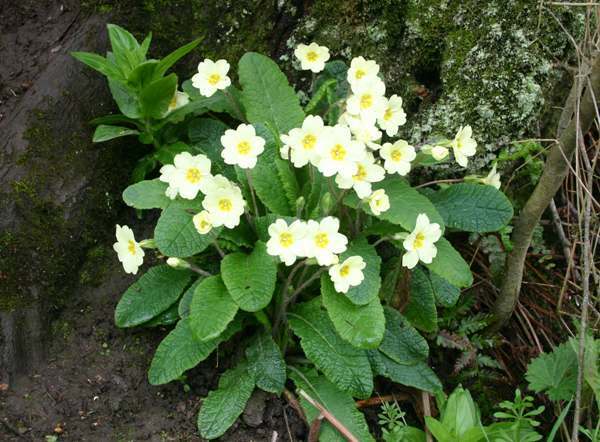 In mild winters, Primroses can appear before Christmas in southern Britain, but they are usually at their best in March and April and continue blooming well into May or early June. In 1753 Carl Linnaeus called the Primrose Primula acaulis. English botanist William Hudson (1734 - 1793) established its currently-accepted scientific name Primula vulgaris in a 1762 publication. Not all primroses are yellow, even in the wild. Some have almost pure white flowers while others have a pink or purplish tinge. These mauve specimens were seen in Cenarth Woods in the Teifi Valley in West Wales during April. 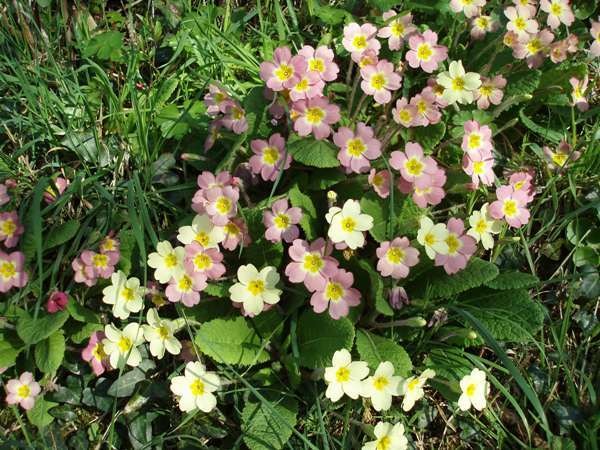 The common name Primrose comes from the Latin Prima rosa, meaning first rose. They are one of the first of the rose-like flowers to appear, but the name seems incongruous since Primroses do not belong to the rose family, Rosaceae. 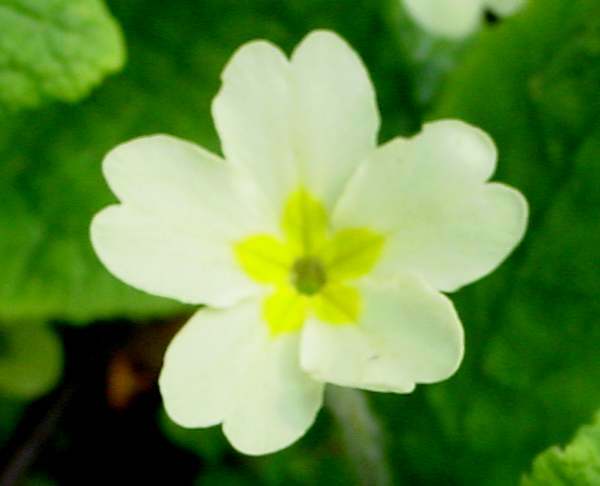 The scientific name reflects the early appearance of this flower in its genus name Primula, while the specific epithet vulgaris is Latin and means common. Near conurbations its is likely that pinkish Primroses are cultivars that have escaped from gardens (or have been thrown out). 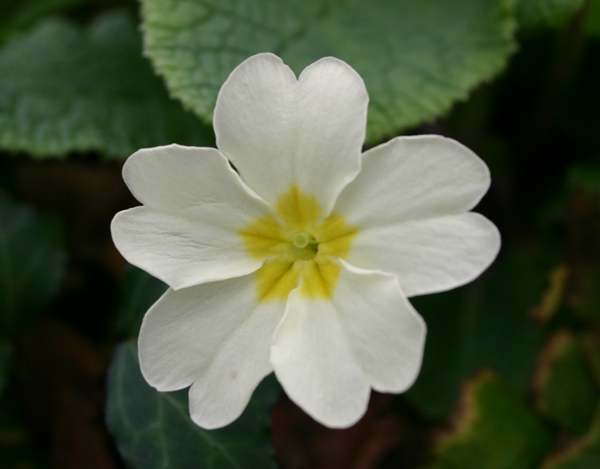 In the past Primrose were thought to be a powerful medicine for treating painful conditions such as muscular rheumatism, paralysis and gout; the leaves were used to dress wounds; and the flowers are considered edible and were once popular in the dish known as Primrose Pottage. An infusion of the petals makes Primrose Tea. Cowslips, Primula veris, are sometimes mistaken for Primroses. Primroses hybridise readily with Cowslips and other members of the Primula genus. A very common sight in the wild where both Cowslips and Primroses grow is the False Oxlip. which is often wrongly identified as Primula elatior, the true Oxlip which in Britain is found only locally in south-east England. 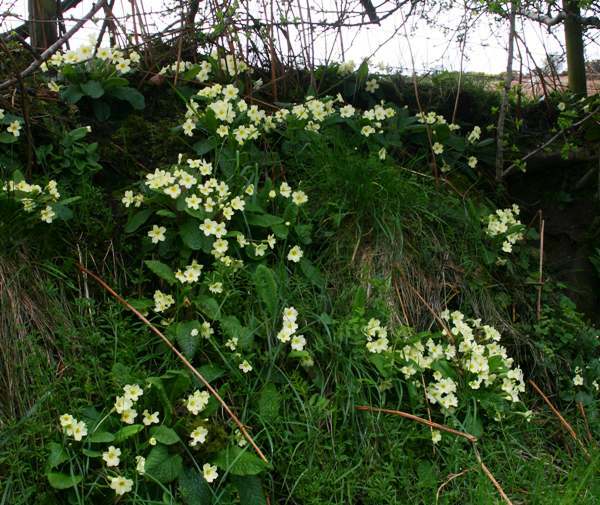 In the picture above, taken at the edge of a steeply-sloping field in Pembrokeshire, Wales, Primroses and False Oxlips are growing side by side; however, Cowslips were also seen nearby.